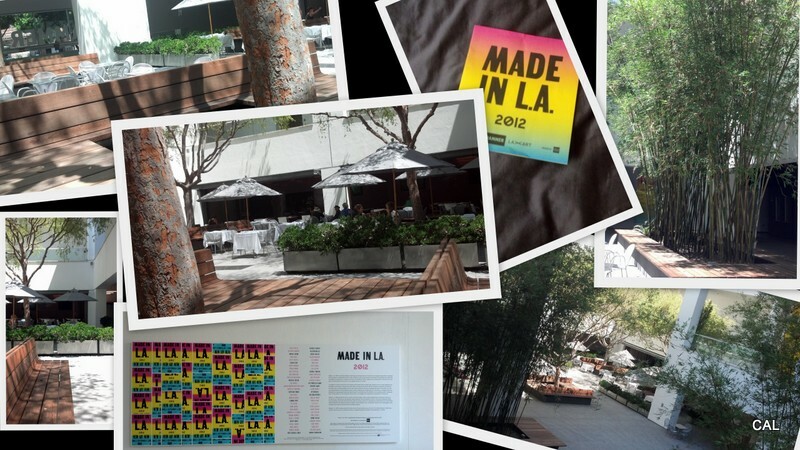 I spent this past Sunday afternoon getting some culture at the Made in L.A. 2012 exhibit at the Hammer Museum in Westwood. It kept with the weekend theme of spending time in public places flooding with central air to beat the summer heat and learn something new at the same time. What a gem of a space! It was such a tranquil afternoon roaming the galleries taking in the works of Los Angeles based artists across the small campus. The Westwood exhibit features the expressions of 38 locals in the forms of paintings, video installations, sculpture and photographs; spread over 2 other participating institutions, totaling 60 complete works. I won’t lie, it took me some time to relax into what I was observing around me. During the first half-hour, the very analytical side of me wanted to make sure I was understanding exactly what I was looking at and what the artist was trying to say. I wouldn’t have minded the use of interpretive media to supplement and better comprehend the context of a work of art in this case (hello audio tour?). However, much to my surprise and slight disappointment to my analytical ego, the Hammer sticks simply to sparse wall text, perhaps to keep a very clean and art-focused environment. The galleries are very open and don’t innundate you with anything other than the pieces. This was clearly done intentionally, and as I kept walking I accepted that intention. Once I simply settled into looking at the art around me and not trying to interpret every single line, color choice, use of composition (and let’s be honest, those “what the heck is this” thoughts), I began to see the works as artistic expressions and appreciated it more not for what it represented (because I gathered that was left mostly up to the viewer), but for what the human mind cultivated and then physically created. I have to say though, my absolute favorite part of the Hammer was their permanent collection gallery filled with the timeless and classic paintings of Rembrandt, van Gogh, and Cézzane, amongst others. There’s something so remarkable about standing in front of a 373 year old oil painting by Rembrandt with such life-like strokes, it looks like a photograph. It blew me away! I marveled at the imagery and feeling I got gazing at my favorite piece of the day, an 1865 painting called Morning, by Jean-Baptiste-Camille Corot. I would hang it in my house. I couldn’t have asked more a more beautiful and relaxing afternoon. It seemed the more I immersed myself in the world around me the calmer I became, and the life outside those gallery doors faded away for a couple of hours. The Hammer’s Made in L.A. exhibit is an excellent place to spend some time, but I warn you to go with an open mind.